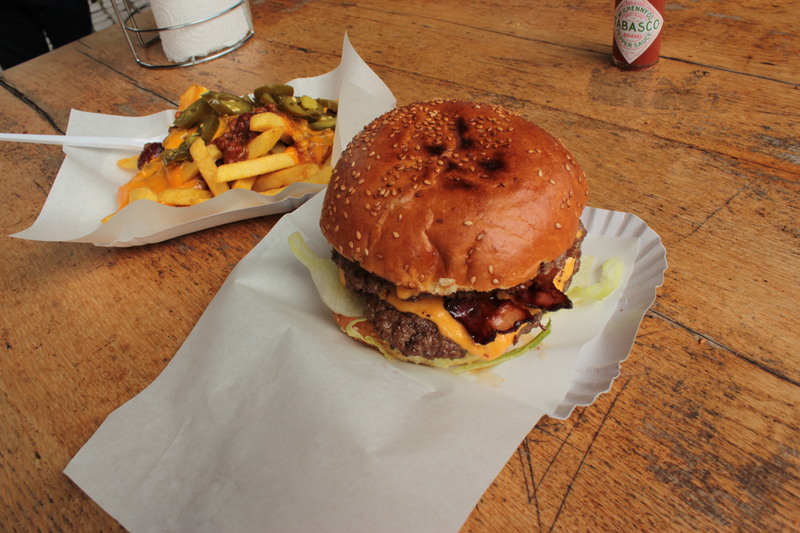 Burgermeister is probably the coolest burger joint we’ve ever been to. 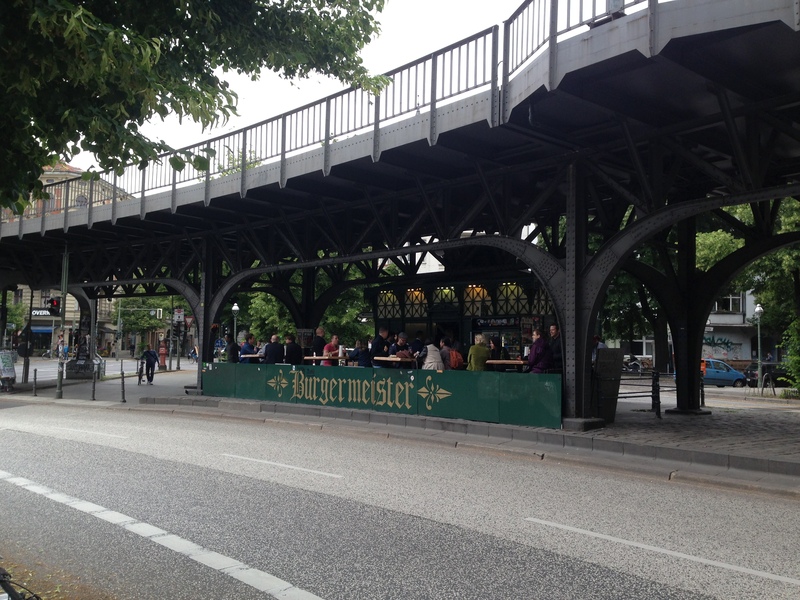 A little gem tucked away underneath a bridge in East Berlin, serving up burgers all day and night out of an old converted public toilet. Don’t let that put you off, though – this place is spotless, exudes cool and the food is absolutely first rate. We actually knew that we were approaching Burgermeister from smelling the beef patties from around the corner and as we turned on to the street we were greeted to a large group of hungry customers huddled underneath a bridge, queueing up to place their order and grab a numbered ticket as cool, loud hip-hop blasted from the speakers around the stand. There aren’t a lot of tables at Burgermeister and you should expect to huddle around one with other diners during busy times – not that it seemed to bother any of the customers who were waiting along with us. If you don’t want to sit at a table or take your burger away, there are also a number of old beer crates that have been cleverly turned into chairs for you to sit on – even the police were lining up for burgers and crowding round tables with other customers! 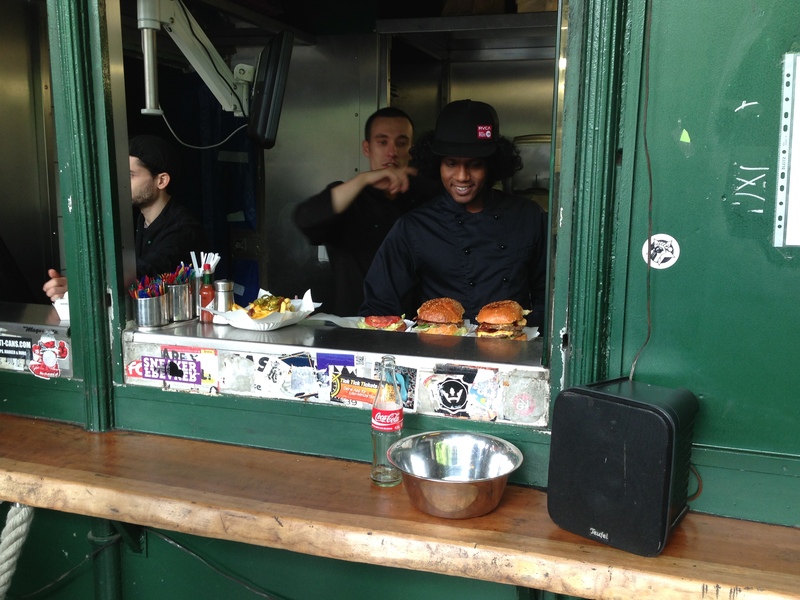 Everything about Burgermeister; from the ordering system, to the music, the makeshift tables and the food itself screams cool. 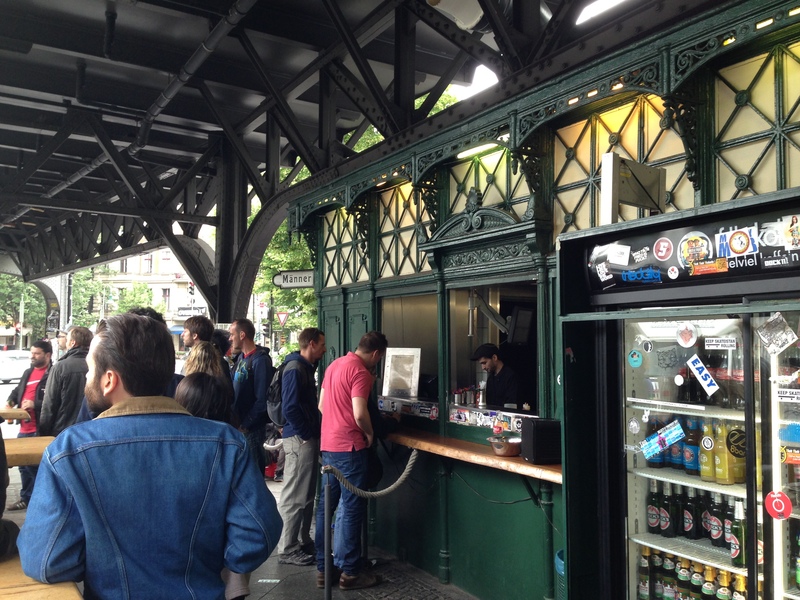 For us, it is a place that perfectly sums up the city of Berlin. We left Burgermeister wishing that we could have something similar in Glasgow. We joined the queue, placed our order, got our ticket, found a space at a table and waited. We went for the ‘Meister Aller Klassen‘ burger; which, loosely translated means ‘master of all classes‘ (perhaps ‘the burger of all burgers’?). It consists of two beef patties topped with double American cheese, salad, bacon, jalapeños and barbecue sauce. 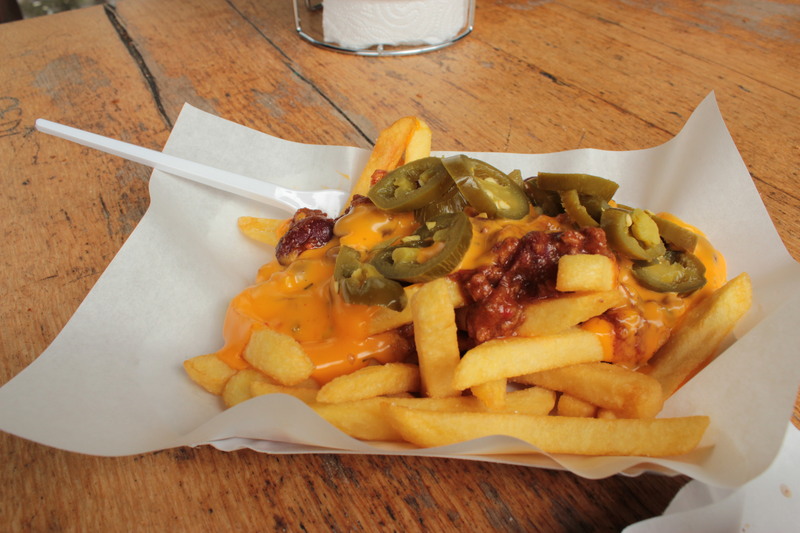 We also opted for a side of chilli cheese fries to go with it. The place was completely packed and it did mean that we waited approximately 15-20 minutes for our food. We didn’t mind the wait and could clearly see that the staff were working like a well oiled machine to get the food out as quickly as possible, while taking care to ensure that everything was just right. The wait times could possibly be an issue during bad weather, but it didn’t cause any problems during our visit. 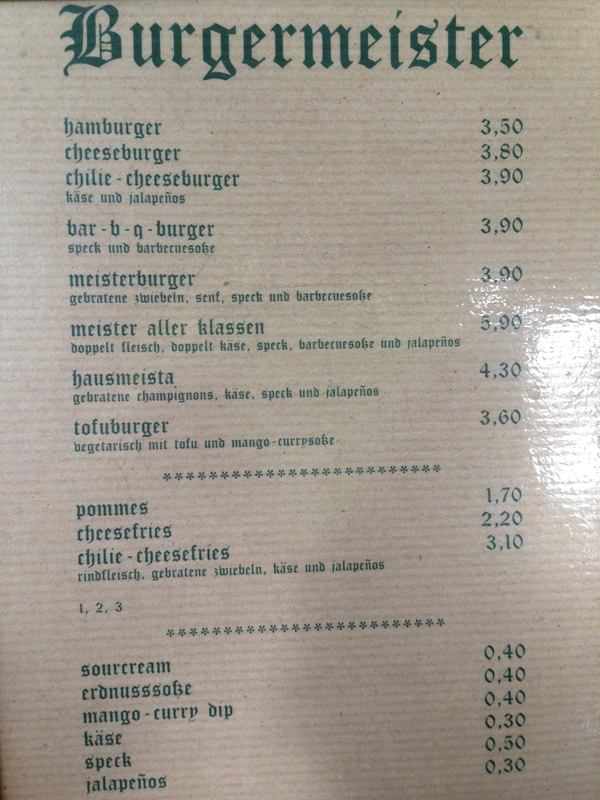 The menu at Burgermeister is fairly small and to the point, but we liked it. As you can see, everything is well priced too. Our burger was the most expensive one of the menu at only 5,90 – a real bargain! When our number was called, we saw our burger appear straight from the griddle and on to the counter and it looked absolutely delicious. Presentation-wise, I don’t think you could ask for more with this burger. 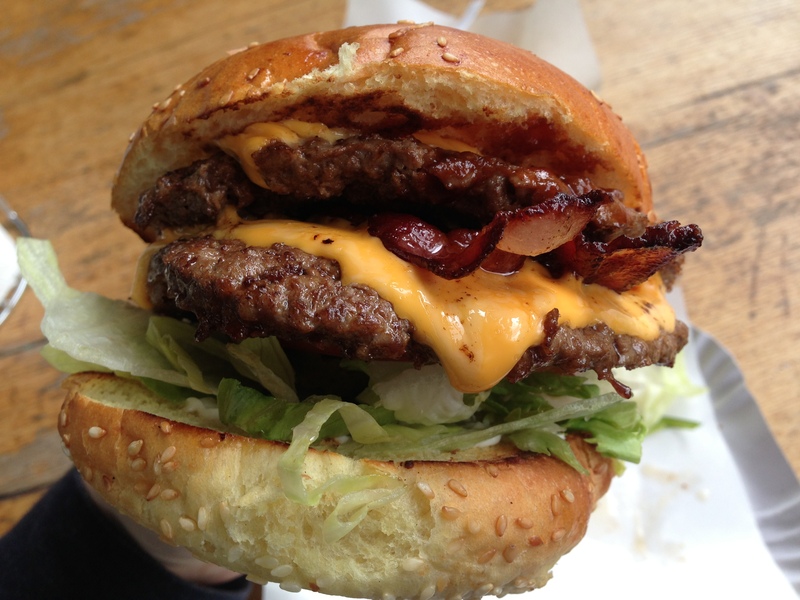 The bun was toasted well without being too crunchy and the American cheese was perfectly melted on to the patties. It looked high quality without looking overly gourmet. 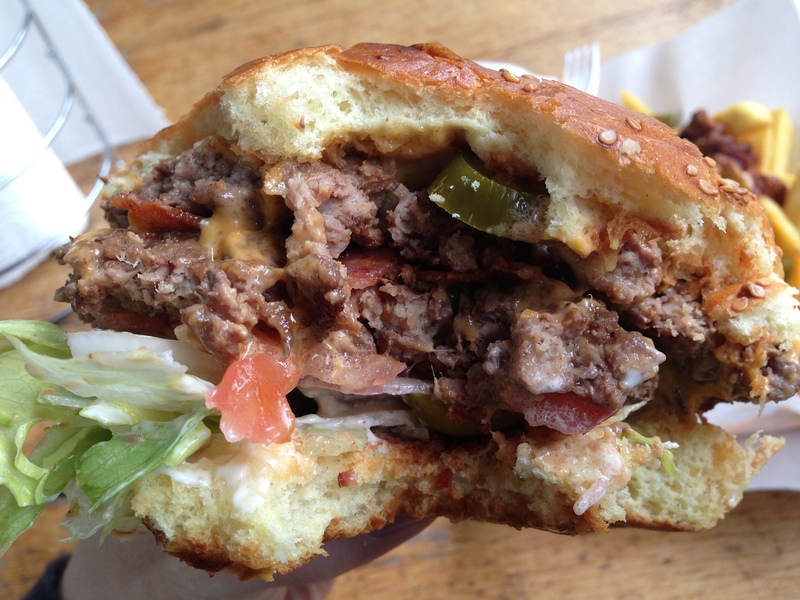 This is a real down n’ dirty burger and we loved the look of it. So, how did it taste? Simply put, as good as it looks. The beef, while not as pink on the inside as some of the other burgers that we had in Berlin, was so incredibly juicy and well seasoned that it didn’t really matter. It wasn’t overcooked at all and was packed full of flavour. The patties also weren’t too thick which meant that even though this was a double burger, it was still perfectly manageable and didn’t fall apart. 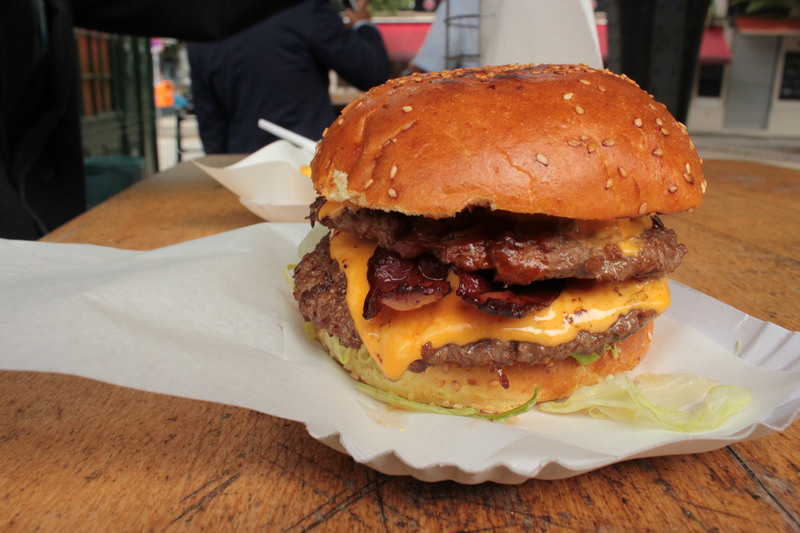 I also need to highlight the bacon, which was some of the best bacon I’ve had on a burger – it was perfectly crispy without being hard and I loved how it was layered throughout. The cheese, which was melted over the beef, acted almost like a tasty glue which held everything together. The barbecue sauce added a nice smokiness without being too overpowering and the jalapeños finished the whole thing off with a nice kick. Simply put, a top-notch burger and I don’t think it could have been improved in any way. The chilli cheese fries were also fantastic and I’ll go as far as to call them the best chilli cheese fries I’ve ever had. The same American cheese that was used for the burger was used here too and it worked so well. It was warm, gloopy and at the end, I was almost ready to lick the paper just to finish off what was left of it! The chilli was very well seasoned and appeared to be homemade, as opposed to just any old chilli thrown over some fries. The fries themselves were good – not the best fries I’ve ever had but the other toppings really made this side dish something special. Burgermeister is without a doubt the most fun you’ll EVER have in a converted public toilet. You should travel to Berlin just to try it. + Cool location & atmosphere. + The best chilli cheese fries we’ve ever had. – We could imagine the wait times being quite frustrating for some, especially having to wait outside in bad weather. If you’re in Berlin, i can only assume you are going to investigate The Bird in prenzlauer berg. Anything less and I will doubt your burger credentials.